The paradigm shift in nutrition is really happening and it’s moving ever faster. Even the industry-sponsored main association of American dietitians (AND) is now saying that saturated fat is probably nothing to worry about! Instead they recommend eating less carbohydrates, especially less sugar. Pretty big news. I’ve added Dr. Hallberg’s blog to our page with updates from great health blogs. 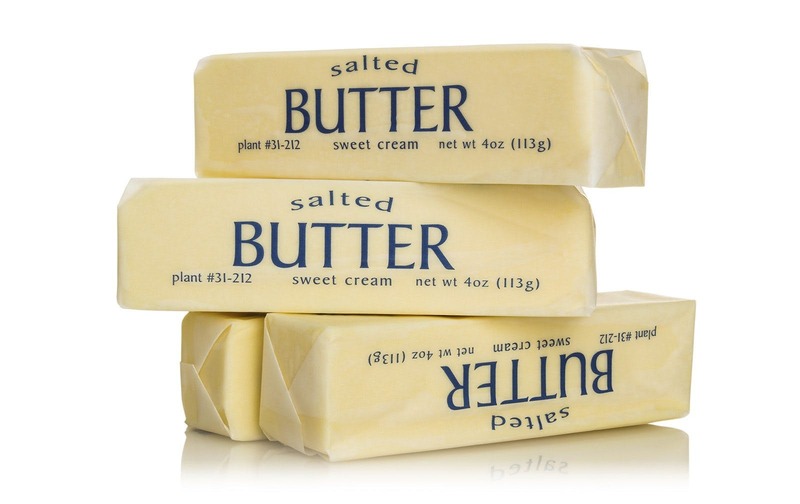 Major Fitness Company: Eat Butter, It’s Good for You! Now if the cycling community here would get the word. We did a charity bike ride yesterday and the post-ride festivities involved a pancake feed. Ken checked it out (I was finishing a longer ride and was still out on course) and saw a bowl of pats of a butter-like substance. He inquired, and when the server checked the packages, replied that it was Imperial margarine. Needless to say, I didn't even bother to go into the hall when I finished my 62 miles. When we got home, we found that our guides had arrived for our upcoming Bike Ride Across Nebraska, which goes through what is known as "The Beef State," a mostly agricultural rural area. I looked through the guide which contains the information and ads for groups providing meals along the route. As usual, there was a plethora of potato bars, spaghetti dinners, and pancake feeds. Every year, we are given a comment and suggestion form to fill out, and every year we ask that communities be told that not all cyclists are carb-loaders and that high-fat options need to be available, and every year, we go unheeded. When we are on these trips, the small towns often have no restaurants or even grocery stores and the food provided by the host organizations is all there is for miles around. It is a real challenge for us, especially since we are ketogenic and if we can't get enough fat, we won't be able to handle the long-distances we cycle each day. We will take butter and coconut oil along for our morning "bulletproof" coffee which usually sustains us on our daily rides, but dinner is often difficult to find. It is mindboggling that in cattle country real butter and cream are impossible to find! At least our final bike trip of this summer is planned for France - I think they know what butter is there! WAIT! if you read the actual ADA report ..shown as a link in this article…it says POLYunsaturated fats are BETTER than saturated fats, plus reduced carbs. I do not see the POSITIVE of saturated fats being promoted as you imply based on their findings--indeed they only SWITCH to promoting polyFats! "Equation 4 demonstrates that the substitution of polyunsaturated fat for carbohydrate will result in a lesser net risk for cardiovascular disease than if polyunsaturated fat were substituted for saturated fat. This is true because carbohydrate contributes a greater amount to the risk for cardiovascular disease than saturated fat, so the replacement of carbohydrate will necessarily result in a greater improvement in risk. Therefore, it appears that the evidence summarized by the DGAC suggests that the most effective recommendation for the reduction in cardiovascular disease would be a reduction in carbohydrate intake with replacement by polyunsaturated fat. This simplified recommendation would also aid in creating a consistent overall message of the DGA, allowing for consumer messaging to focus on benefits of decreasing added sugars in the diet to reduce cardiovascular disease, obesity, and type 2 diabetes, consistent with the conclusion statements in the added sugars section of the Scientific Report. But, as you quote above, they do acknowledge this: "carbohydrate contributes a greater amount to the risk for cardiovascular disease than saturated fat"
I interpret what the AND is saying as this: the BEST EVIDENCE available does not support telling people to reduce saturated fats --and the DGAC discussion acknowledges this-- but good evidence DOES support a recommendation that people reduce carbohydrates in favor of polyunsaturated fats. They also say such a recommendation would be consistent with the advice on sugar. Part of the problem is the lack of studies examining whether substituting satfat for carbs reduces CVD. Of course we followers of LCHF all believe it is true (and have personally experienced lipid improvements), but even Andreas's list of 14 RCT studies that support low-carb over low-fat diets does not include any studies that directly address the issue of substituting satfat for carbs. Please correct me if I am wrong (and point me to those studies if they exist). Natural whole foods that contain fat, whether meat, coconuts, milk, nuts, fish, and plants in general, contain a mixture of saturated, monounsaturated and polyunsaturated fats. The amounts of each differ. Plus there are different types and names of each, and chains of molecules are different. Some types generate more ketones. Some may affect the cholesterol level, but even the letter by the Association says the level does not affect the risk of cardiovascular disease. Omega 3(polyunsaturated) is absolutely needed by the body/brain. I get at least a tbs of cod liver oil daily. Cindy, I certainly agree with you about fat. But again, it's a question of evidence sufficient to support a recommendation telling people they should substitute satfat for carbs. I don't think there are many, if any, good studies that have examined that specifically. Studies of low-carb diets are notorious for getting the low-carb diets wrong (especially making them high-protein) and then coming up with disappointing results for them. But as for the DGAC recommendations, even NuSI, which is totally sympathetic to LCHF, did not say in its comments to DGAC that there was evidence enough to support telling people to substitute satfat for carbs (here are NuSI's comments: http://myemail.constantcontact.com/Official-comments-submitted-April-...). So I think that AND actually was being pretty clever in using those equations to take what evidence there is as far as you can toward supporting fat as a substitute for carbs. DonnaE..I was challenging the 'joy' in the article title in DDsite, NOT your comments. I appreciated you placing the DIRECT statements here, read then over 3 times to be sure I saw they were indeed promoting Polyoils..BUT again, not dissing Omega3…but I swear I have read all over in every book that PUFAs are not as goods as MUFAS (monofat) and Satfat as ideal…I see we should drop corn oil, canola, safflower, as less desirable, no? If there is a study where one group goes on a low carbohydrate diet and the control group does not, isn't that effectively substituting carbohydrates with saturated fat (at least to some extent)? The difficulty with attempting to substitute "saturated fats" in place of "carbohydrates" is that animal meat is made up of monounsaturated, polyunsaturated, and saturated fats. In fact, it's mostly monounsaturated fat (i.e., lard -- that evil thing!! -- is mainly monounsaturated fat of the same type as what is in olive oil). Unless you make a very specific attempt to use only saturated fat (such as by using coconut oil or beef tallow), you'll always be "substituting" some mix of fats for carbohydrate. And then you're not really "substituting" fat for carbohydrates; you're simply not eating carbohydrates. I think everyone avoids saying "saturated fat is good for you" because they need to have baby steps at this point. Asserting that saturated fat is not bad for you, and appears to be supported by a mountain of evidence, is hard enough. Saying that saturated fat is good for you puts you in the "crazy" category. BobM..I think you nailed it..I've read experts say it will take a decade to accept saturated fats and overcome AMA, USDA, etc shame in their promotion of carbs and grains, which we know was the largest, global-recommended, untested experiment on an entire nation EVER foisted on an unsuspecting public, taught to trust their gov. And that fighting cancer with LCHF may be the real reason we accept butter back to our plate. Some people and websites say "healthy" + fats, not High, and quickly lead with "olive oil..avacado" as two 'safe' words to diffuse the fear of fats… my own urology NP even freaked out over the word butter, lecturing me on cholesterol, artery hardening, CVA risk with a LCHF diet....sheesh. Maybe my own prejudice doesn't want to accept polyoils even with their supposed 20% advantage in reducing CVA, over SFAs. these two links show the facts on Oils…work a quick read. I read your post Peggy Holloway and commiserate :( I live in Canada where if you dig deep enough you can usually find fairly healthy options, depending on where you are, but I am amazed every time I go down to the States by how hard it is to find anything remotely healthy to eat down there - hopefully it will change one day. I too am going to France this year, in June, and am really looking forward to it, cheese, butter, cream duck fat .......... Yum !